Regret is poison for the mind. My guy, Gary Vaynerchuk‘s enemy is regret. Shoulda Coulda and Woulda lead to regret. Those three words are like a three-headed monster and following that monster will only lead you to the top of Regret Mountain. With this mindset coaching article you will learn that you're the one that painted the picture of the Shoulda Coulda and Woulda monster. Because you did that you'll be able to take break free of the fear that's holding you back from living your life. Why Learn About Shoulda Coulda And Woulda Lead To Regret? We choose to live in the past when we constantly think of what we shoulda done differently. Yes, you shoulda paid more attention to your wife or husband. Then they wouldn't have wanted a divorce. You coulda had more protein throughout your day to make you feel fuller longer. Instead, you chose to eat whatever was in the vending machine. You woulda had more time with your children. If you woulda just put down your phone and helped them with their homework. See what that does? It creates a place of regret from the past. Living in the moment is being grateful for each and everything in your life no matter if it is positive or negative. Not judging the experience and simply learning from it all. Therefore you'll take that picture down that you painted of the Shoulda Coulda Woulda monster and put it on the floor by your bed. Then you can go to sleep in peace knowing that when you wake up it won't be there anymore. Practice doing that every night for many days, let's pick an amount and say 30. Start living in the moment and doing things that make you happy. Shoulda coulda and would lead to regret and now the top of Regret Mountain is far behind you. The best part about that is you can apply this knowledge to every aspect of your life. You don't have to worry about overthinking every decision in your life. Because you're now following a path that comes from a place of happiness and no regrets. Be happy with doing one round minimum. Start with one round because by pure inertia you'll eventually do more than one round by the time you finish your 365 WOD Journey. So get to your WOD for today and kill that three-headed monster with kindness. Then you won't even be able to look back at it anymore because you're only focused on what's ahead of you versus what's behind you. 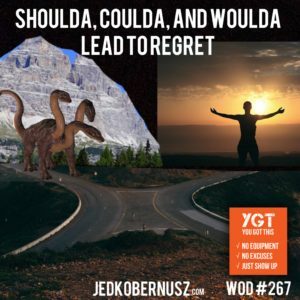 PSS: If you found this WOD about Shoulda Coulda And Woulda Lead To Regret provided value, then consider giving an At-Will Offering. Because then I can keep helping. Go Here To Give. Thank you for your time, attention and generosity. When starting at WOD #1 did you even THINK you'd make it to two hundred? Today you'll learn that pushing through major milestones is the most important thing you can do for PERMANENT change. How many “Holidays” are there in year? I put the world Holidays in quotes because every day could be considered a holiday. Think about that for a moment. If you have monthly birthday celebrations at work, annual getaways, small celebrations, LARGE celebrations, traditional holidays and any other reason to eat high sugary foods. Now, count how many days those “holidays” I just mentioned. That's about 10 days a month. Let's take that and add it up per year. That's 120 days per year. Which then means that 33% of the year you will be eating high sugary foods. Less than 40mg of sugar per day is what we are “suppose” to eat. My guess is that one piece of cake and that cookie is WELL over 40mg. Pushing through major milestones without these high sugary foods takes a massive amount of practice. Each time you attend one of these celebrations and take less and less you are interrupting your patterns. 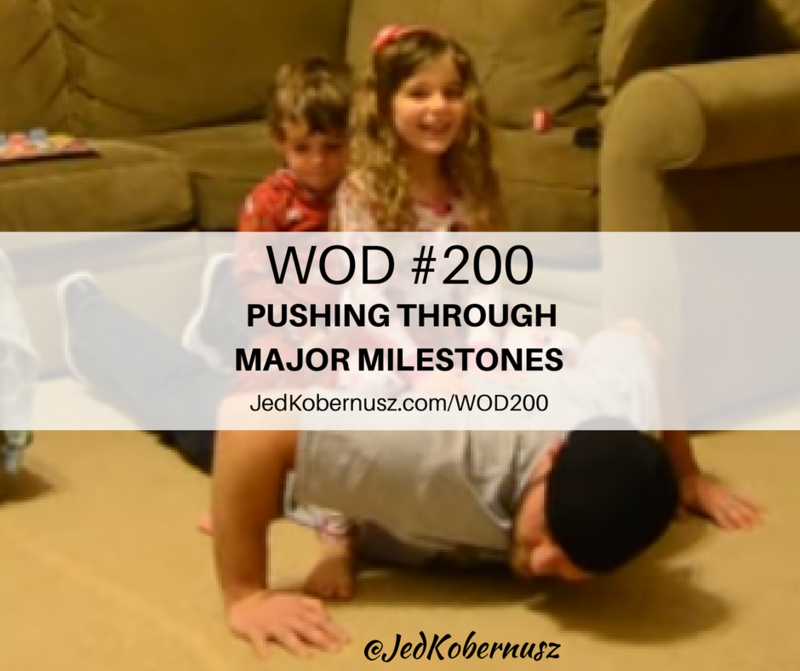 Also making it to WOD #200 is another way you're pushing through major milestones. When your self worth goes up with each WOD the amount of change that happens within yourself is a direct correlation to it. The question that you might be asking is why. The consistency and dedication to yourself is the answer. With each WOD you complete you become one step closer to the best expression of yourself. Today's WOD will challenge you both mentally and physically. Think about day one when you're going through this WOD. You're simply going to do 200 Push-Ups. Day one how may Push-Ups did you do? My intuition tells me no where NEAR 200. Go get'em and keep going #Kobernation! 200 Push-Ups All at ONCE! Thank you SO much for hanging with me for 200 WODs. If you enjoyed this post about Pushing Through Major Milestones , retweet and comment below what was most noteworthy please. When starting something new it can be scary, but when starting the WODs you become part of a powerful community called #Kobernation. The #Kobernation has been there the entire time, it's just taking the time to realize there are SO many other people who are struggling just like you. A community, like the #Kobernation, gives you a sense of accountability and an opportunity to share similar difficulties. It also creates love and trust for one another. The bond that is created is very powerful. When I first started making WODs the #Kobernation was created without me even knowing it. People who tell me how their doing because of my WODs are instantly IN the #Kobernation. Even the ones that DON'T tell me are in. (Those people are called “Lurkers.” Lurkers are people who use my WODs and learn from my content and say NOTHING to me about it). I love each and every person who is a part of the #Kobernation because it's my life's purpose to create a safe spot for people to change and grow into the person they were meant to be. Therefore that's what each WOW is all about… For YOU to feel safe. There are too many people out there taking advantage of people who start out on their journey to a healthy lifestyle. Plus they pay a boat load for these crappy programs. When you come into the powerful community called the Kobernation you don't have to pay a dang thing. The only thing I ask is that you donate (JedKobernusz.com/Donate) what you THINK the value of each WOW is worth. I understand that people aren't going to like ALL the WOWs, but keep trying each one and you'll be surprised and how proud that you've went from WOD #1 to WOD #195. Taking out all excuses and barriers is what I do. I've created a # on Instagram specifically for the community of the #Kobernation. Go to JedKobernusz.com/Kobernation to see it. Then take a use it in your comments of your picture you post to become part of the #Kobernation. 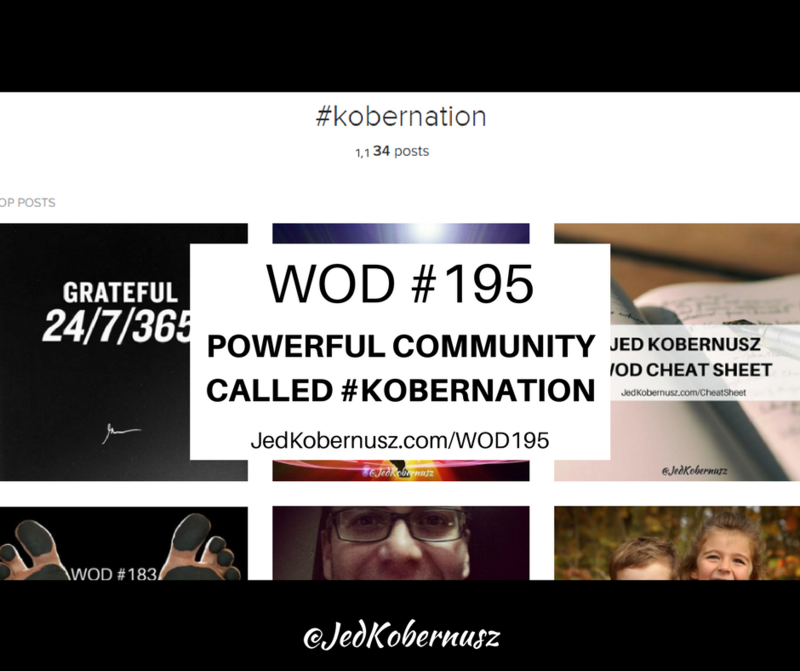 If you enjoyed this post about Powerful Community Called Kobernation , retweet and comment below what was most noteworthy please. Do you think you can do ANYTHING in life? 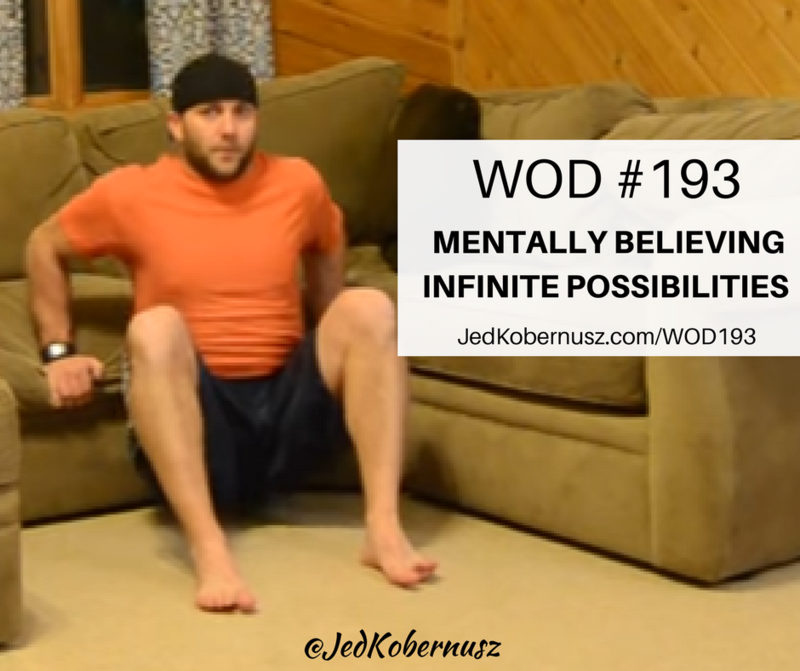 If not WOD #193 will definitely challenge your mental beliefs. Mentally believing infinite possibilities is something that takes practice. When talking about mental health we usually go towards depression, anxiety or other mental illnesses. 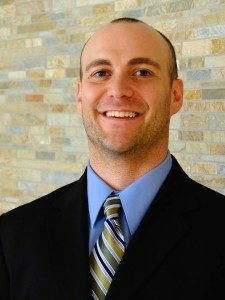 I'm talking about something different with this WOD and coaching piece. When coaching my clients teaching them about their beliefs towards themselves is key. Because the main stream media likes us to think that our bodies “turn fat into muscle” it's crazy to me that SO many people get this stuck in their head. Therefore I'm here to shed some light on that situation. Some people can lose weight without even trying. Others have to work VERY hard at it. Because of the media we are up against some VERY heavy hitters. So take what you've learned about energy and apply it to your own experience. Measure your progress in Inches not Pounds. Then when the weight stops coming off, you will still be motivated to keep going. All you're doing when you become “leaner” is changing your bodies composition. Meaning you will have less fat and more muscle. The only way you can TRULY know that is if the inches are coming off and your weight is staying the same. If you're weight is staying the same and you are NOT losing inches you are NOT using more energy (aka fat) and gaining muscle. You are simply put at a plateau. That is a time for another CHANGE. So let's change your mental belief's about how to turn muscle into fat (because that's not even physiologically possible) and get moving more with WOD #193. If you enjoyed this post about Mentally Believing Infinite Possibilities , retweet and comment below what was most noteworthy please.